Two years ago Disney Legend Richard Sherman told the tale of how Walt Disney was dazzled by Fourth of July fireworks. Walt’s love for these spectacular sparks in the sky inspired him to offer nightly fireworks displays for guests at his Disneyland park. 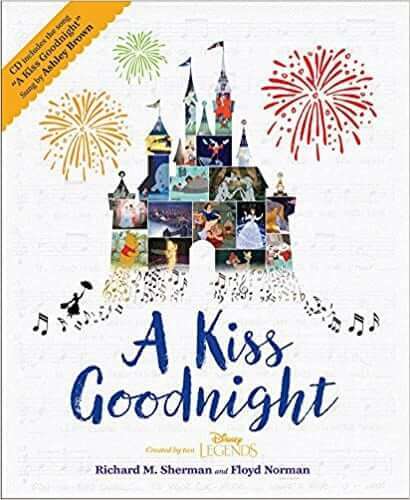 He dubbed this practice “a kiss goodnight.” Based on that passion and inspiration, Mr. Sherman not only composed a song to commemorate the magic, he has also penned a charming storybook re-telling this timely tale. The hardcover tribute will include a CD and download of Broadway star Ashely Brown singing the title song. In addition to being written by Richard Sherman and Adrienne Brown, this collectable treasure of a storybook is illustrated by Disney Legend Floyd Norman. You can bring your copy of this Disneyland magic home by pre-ordering the book with CD now, to be released on August 22, 2017. In the meantime, while you wait for your copy of “A Kiss Goodnight,” here is a video of Richard Sherman and Ashley Brown from their 2015 D23 Expo appearance.